A long-awaited rocket launch in the name of Flat Earth awareness finally happened in late March 2018. The rocket, and pilot Mad Mike Hughes, survived relatively unscathed. He said he's planning a launch from Antarctica next. In recent days, some exciting news has emerged from the Flat Earthers’ world. Well, nearly a year to the date after that momentous achievement, the limousine-driving daredevil and gubernatorial candidate has announced he’s building upon the lessons learned last year and pushing the limits even further. There, Hughes will announce a “’rockoon’ launch to the edge of space” and “an Antarctic expedition with the goal of reaching the edge of the world … to prove once and for all that this Earth is flat,” according to the event's promotional declaration. It seems that Hughes is upset regarding his appearance in "insensitive doofus" Logan Paul's movie about the topic. Per an associate, the Science Channel "is filming Mike's progress as he plans to go to space to prove Flat Earth (or debunk it)." Thus, the May announcement in Vegas. Why that location, you may ask? Hughes may not alone in seeing Antarctica holds the key to proving their assertion. Another group either does or does not plan to sail to the “continent” through the Flat Earth International Conference. So, there’s that. There is also this: Hughes has kind of grown tired of the movement's political infighting. We caught up with him Thursday afternoon on the phone from California where he was "putting decals on the rocket right now!" Before any sort of Antarctica excursion, he's planning for a May 9 launch either in New Mexico "or the middle of the ocean if the government tries to stop me." 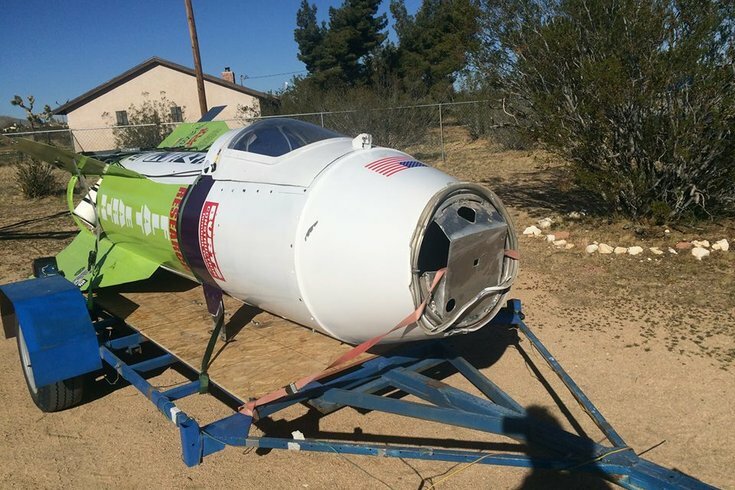 Of the TV show, he said it will be based on, among other things, "the "crazy s*** I do and the history of rocketry." He hopes to reach the Kármán line, some 62.8 miles above Earth where space begins. "That way, we'll see what shape this rock really is," he said. "More people will watch this than those who watched the fake moon landing. It will be an incredible, incredible event. People will see what I'm seeing for three hours up there and back and they'll be able to make up their own minds." Regarding Antarctica, he said that a friend of his is working to put a deal together for that to happen, and it's a mission that will totally be discussed in Vegas, a show he put together because of infighting. "I'm really tired of a bunch of the big names in the Flat Earth movement. Ego got involved when people started making money, and I head-butted with a lot of people," he said. "I'm the only guy capable of actually proving what shape this rock is, and that's by going up into space to do it. People weren't inviting me to big conferences after everything I've done for Flat Earth. Nobody has brought as much attention to it as I have."